Started in 2004, the William Raveis Charitable Fund partnered with organizations across the Northeast to provide funding, and both physical and emotional support to patients and their families affected by breast cancer. Fundraising was done by individual William Raveis Real Estate offices and agents through local events and raffle ticket sales. Thousands of dollars were raised and donated each year. Since 2014, the fund has cumulatively raised just under the $4 million dollars. In 2015, Bill Raveis was put in touch with the Damon Runyon Cancer Research Foundation through a good friend. After coming away hugely impressed with the remarkable and unique organization, a partnership was formed with the Damon Runyon Cancer Research Foundation. The William Raveis Charitable Fund officially made the switch from breast cancer to a focus on finding a cure for all forms of cancer. The William Raveis Ride + Walk is an annual bike and walk fundraising event hosted by William Raveis, Inc. All proceeds from the Ride + Walk go to the Damon Runyon Cancer Research Foundation. The goal of the Ride + Walk is to raise awareness, not just funds, for the great work being done by Damon Runyon scientists across the country. 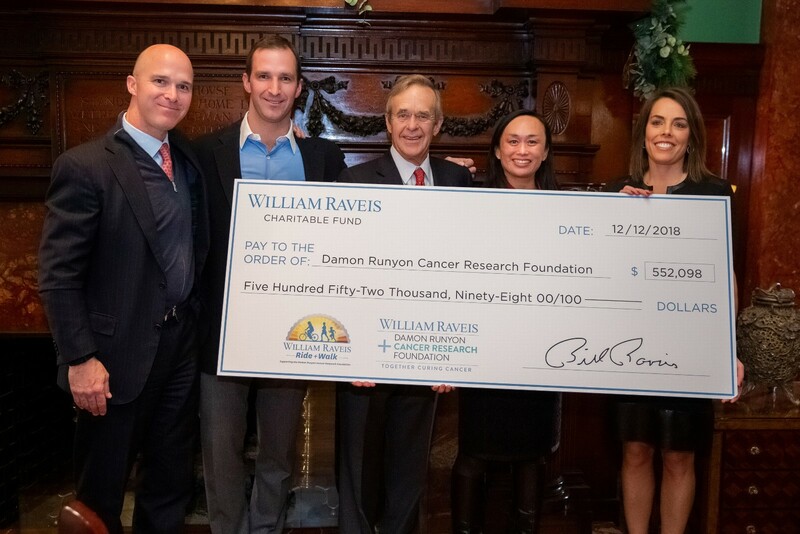 In 2018, William Raveis was proud to present the Damon Runyon Cancer Research Foundation with a check for $552,098. Over $2 Million has been raised for cancer research in the first three years of the Ride + Walk!